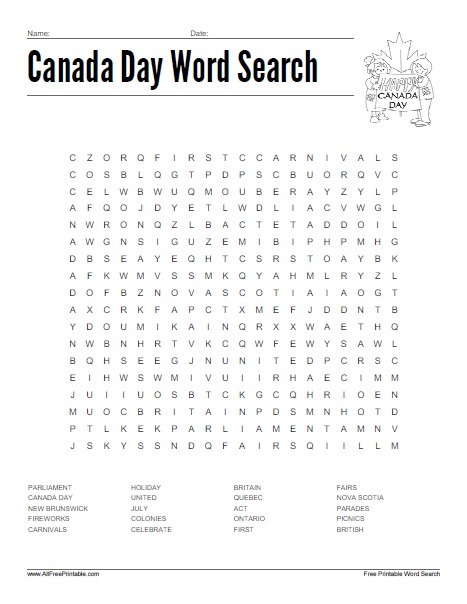 Free Printable Canada Day Word Search. Free Printable Word Search for a fun Canada Day celebration. A great activity game to share with kids at home, school or at summer camp. Celebrate Canada Day the 1st day of July and try to find all the related words like Quebec, Parades, Act, Colonies, Ontario, Carnivals, Parliament, Picnics, Fairs, July, Nova Scotia, British, New Brunswick, United and many more. The word search includes 20 words from Canada Day and the answers on page 2. The Free Printable Canada Day Word Search Puzzle is ready to print in PDF format.